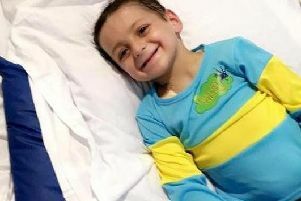 A five-year-old boy is continuing to receive hospital treatment after suffering a fractured eye socket after being hit by a car. The boy was hit by a car in Milbank Road at about 4.30pm yesterday. The incident happened in Milbank Road yesterday. He suffered facial injuries in the collision, and was taken by ambulance to James Cook University Hospital, in Middlesbrough, where he remains. A spokesman for Cleveland Police said: "We were called yesterday at 4.55pm to a report of a road traffic collision. "The car involved was a Ford EcoSport. "An air ambulance was at the scene, but the boy was taken to James Cook University Hospital by road ambulance. "He suffered a fractured eye socket and facial injuries, and remains in hospital." The road was closed while the emergency services dealt with the incident. A spokesman from the North East Ambulance Service said: "We were called to a collision involving a car and a five-year-old boy at 4.37pm. "We sent a paramedic ambulance and had support from the air ambulance support unit. "The boy was taken to James Cook Hospital." A Great North Air Ambulance Service (GNAAS) spokesman said: "We were called to assist the North East Ambulance Service with a child who had reportedly been knocked over by a car. "He was treated on scene by the crew before being transported by land ambulance accompanied by the GNAAS team."